You've had peanut butter. You've had toffee. But have you ever tried putting peanut butter IN your toffee? 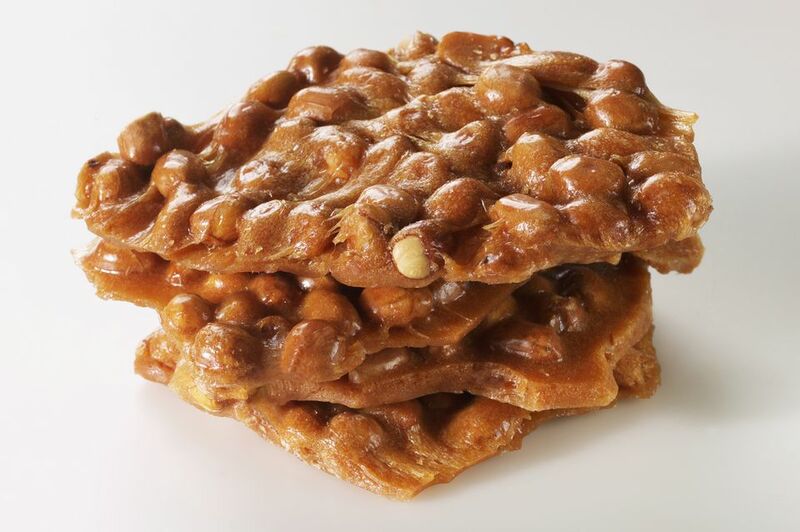 This toffee is light and crunchy, with lots of salted peanuts and a wonderful peanut flavor. Don't confuse this recipe with peanut brittle, which is similar but not the same. Peanut ​brittles most often contain baking soda, which aerates the candy and gives it a lighter, crispier texture. Peanut brittles are also typically pulled while they cool down, so the candy becomes very thin (and brittle, hence the name). This is a toffee, so it does not contain baking soda and is not pulled while cooling. Thus, the final result will be thicker and have more of a crunchy, slightly sticky texture. If you want to try a comparison, make this recipe and then try my recipe for Spicy Peanut Brittle or Salted Chocolate Peanut Brittle! This toffee is great on its own, or you can also dip individual shards in dark chocolate for an even more indulgent treat. Try chopping it up and adding it to chocolate clusters, sprinkling it on truffles, or using it as a topping for cupcakes or cakes! To make this toffee, prepare a 9x9-inch baking pan by lining it with aluminum foil and spraying the foil with nonstick cooking spray. Set aside for now. Combine the sugar, corn syrup and water in a medium saucepan over medium heat. Stir with a rubber spatula while the sugar dissolves. Cover the saucepan with a lid and allow the mixture to boil for 2-3 minutes, then uncover the pan and insert a candy thermometer. Continue to cook the candy, stirring occasionally to prevent it from scorching, until the mixture reaches 305 degrees Fahrenheit. This process should take approximately 15-20 minutes, depending on your pan and your stove. As soon as the mixture reaches the proper temperature, remove the pan from the heat and quickly stir in the peanut butter and salted peanuts. Stir until everything is homogeneous, then pour the candy into the prepared pan. Use an oiled spatula to spread it out into an even thickness. Let the candy sit for a few minutes, and once it begins to set but is still soft and pliable, score the top into squares with a sharp knife sprayed with nonstick cooking spray. Allow the candy to cool completely at room temperature, for at least an hour. Once cool, break it apart along the previously scored lines so that you have small squares of toffee. Store the Peanut Butter Toffee in an airtight container at room temperature for up to two weeks. Click Here to View All Toffee Candy Recipes!